There are two ways to prepare for WSDA (Washington State Department of Agriculture) pesticide exams although a combination of the two methods is highly recommended. You may obtain and study the corresponding Washington State University (WSU) exam study manual or you may attend a pre-license training course. WSU conducts statewide pre-license shortcourses in English each winter. Go to their website to determine availability of courses in your area. Brochures on these courses are mailed annually to all WSDA pesticide license holders. 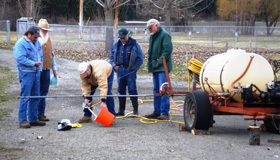 For Public Operator tests, the WSDA Spokane Office conducts testing sessions the first Wednesday of each month. Meetings are the 1st Wednesday of each month at various locations throughout Ferry County. For the next meeting date and location, contact the Weed Board Office at (509) 775-5225 x1111. Each meeting earns 1 credit. Call the WSU Ferry County Extension office to schedule a time to come and watch videos on a wide variety of topics, such as Calibration, Ground Squirrel Management, or A Balanced Approach to Noxious Weeds. Each hour of video earns 1 credit. You can also earn credits by taking an Internet Course. Pre-license and recertification internet course modules are available for people in Washington and in other states. Pre-license modules are self-study courses that can be used in conjunction with study manuals to prepare for state pesticide exams. Internet recertification modules provide one state recertification credit and take approximately 50 minutes to complete.